During their annual migration to wintering sites in Mexico, monarch butterflies encounter dangers ranging from cars and trucks to storms, droughts and predators. A study led by ecologists at the University of Georgia has found evidence that these iconic insects might be facing a new challenge. At sites along their migration route, some migrants encounter resident monarchs that breed year-round in the same locations, using an exotic garden plant. Migrants passing through areas with resident monarchs can be exposed to high levels of disease, and might even stop migrating themselves and stay at the resident sites. With migration patterns of many species changing in response to human activities, the findings, just published in Ecology Letters, have implications for other migratory animals as well as monarchs. Resident colonies of monarch butterflies that breed year-round have appeared in coastal areas from South Carolina to Texas in recent decades with the widespread planting of tropical milkweed. Tropical milkweed is a host plant for monarchs that normally grows in South and Central America and is not native to the U.S. Monarchs require milkweed to lay their eggs. As native milkweeds in the U.S. have become scarcer, tropical milkweed has become popular to sell in garden centers. But unlike native North American milkweeds, tropical milkweed doesn't die back in the winter in warm areas. With a year-round food source available, some monarchs have started to stay put and breed throughout the fall and winter—but at a cost. "We learned from previous research with citizen scientists that monarchs breeding during the winter months in the southern U.S. (rather than migrating to their wintering sites Mexico) suffer extremely high rates of parasitism," said Dara Satterfield of the Smithsonian Institution, who led the research while a doctoral student at the UGA Odum School of Ecology. The parasite, called OE (short for Ophryocystis elektroscirrha), is a debilitating protozoan that shortens monarch lifespans and weakens their flight. Resident monarchs experience high infection levels likely because of the loss of migration, which normally helps to weed out parasites. Next, the researchers wanted to find out what this might mean for migratory monarchs that are still traveling to and from Mexico. "We wanted to understand if relatively healthy migratory butterflies were coming into contact with these really sick butterflies along their migratory routes, and if they showed evidence of being at higher risk for parasites, or changing their movement behaviors," Satterfield said. To find out, Satterfield traveled to Texas during the fall and spring migrations of 2014 and 2015 to visit locations where most of North America's monarchs pass through on their way to and from Mexico. Working with several dedicated citizen scientists, she studied monarchs at nine sites, about half of which contained tropical milkweed supporting year-round breeding monarchs, and half of which contained only native milkweed. She and her colleagues determined which butterflies were year-round residents and which were migrants by analyzing the chemical composition of their wings. "There are about 100 species of milkweed native to North America, and every milkweed species has its own chemical signature," said Sonia Altizer of the Odum School, the study's senior author. "In addition, milkweeds that grow in different geographic regions pick up distinct signatures of elements like carbon and hydrogen. "When the monarch eats the milkweed, it picks up those chemical signatures and retains them in the wings." Satterfield then analyzed infection rates of residents and migrants found at year-round milkweed sites as well as those found at seasonal native milkweed sites. The study showed that some migratory monarchs flying through coastal Texas co-occur at the same locations and times as heavily infected resident monarchs. Of the butterflies sampled during the fall migration, Satterfield found only migrants at the sites with native milkweed. At sites with tropical milkweed on the Texas coast, migrants and residents were both present, with migrants accounting for about half of monarchs at the sites during the fall. "The ecology of monarchs is intimately linked to that of their milkweed food plants," said study co-author Mark Hunter of the University of Michigan. "When we alter the distribution and abundance of milkweeds, either by introducing exotic species or eliminating native species, we should expect to see negative consequences for monarchs." Overall, 95 percent of resident monarchs were infected, compared to just 9 percent of migrants—but at year-round breeding sites, more than a quarter of all migrants were infected. Satterfield cautioned that this doesn't necessarily mean that the migrants at these sites became infected by mixing with residents. "What we think is that these tropical milkweed sites might be drawing in already infected monarchs," said Altizer. "That could be because of something we might call migratory drop-out. Infected butterflies migrate less well and may be more likely to drop out of the migration, and when they see this tropical milkweed, they stay there." 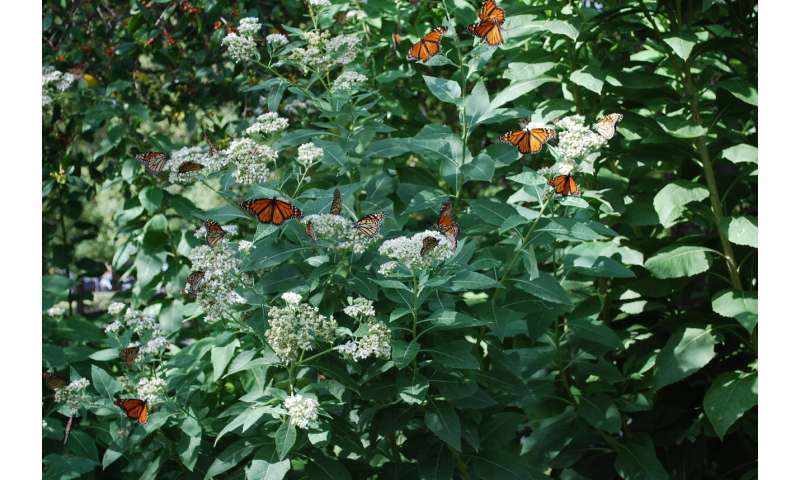 In addition, the researchers found that some of the migrants that stopped at sites with year-round residents were in reproductive condition at a time of year when monarchs do not normally breed. Shifting resources from migration to reproduction might be costly enough to prevent them from completing their journey to Mexico. In the spring, when monarchs need to find milkweed on which to lay their eggs, the researchers found that some migrants flying north from Mexico shared habitat with resident monarchs and laid their eggs on tropical milkweed, raising the risk of infection for the migrants' offspring. Given the decline in monarch numbers, Satterfield said that the increased risk of infection posed by year-round breeding monarchs was concerning, but that there is a solution. "We recommend that habitat restoration for monarchs focus on native species of milkweed, which are synchronized with the monarch's natural migratory cycle and do not enable the year-round breeding that can lead to high parasitism rates," she said. "Swamp milkweed is one good choice, because it's easier to grow than some other native milkweeds, and it's native to much of the eastern U.S. 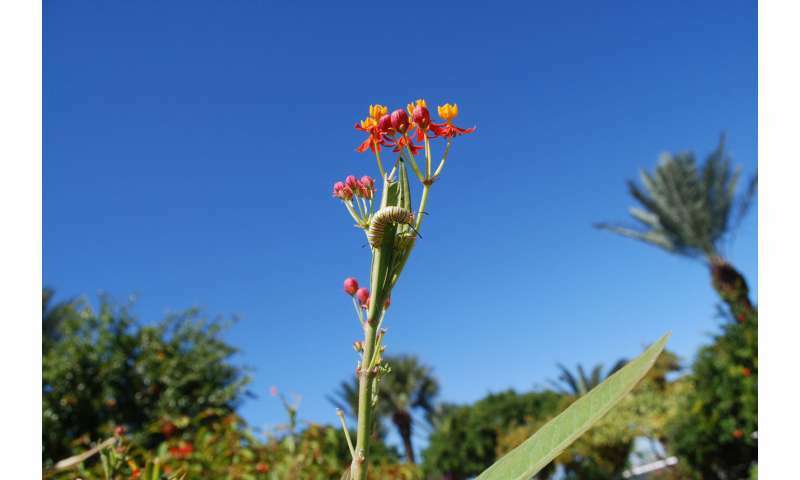 In places where tropical milkweed already occurs, it can be cut back during the fall and winter (monthly), to about 6 inches for the stems—if you live in a coastal area, that's especially important. But even better, replace it with native milkweeds."